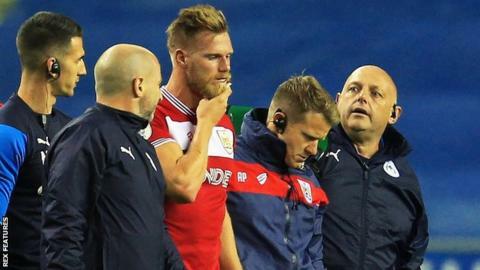 Bristol City defender Tomas Kalas is expected to be out for six weeks after surgery to repair a fractured jaw. The 25-year-old was injured in the second half of Friday's Championship loss at Wigan Athletic. A club statement said the Czech centre-back was kept in hospital overnight on Saturday before an operation on Sunday. Kalas, who helped Fulham win promotion last season, has played five times since joining Bristol City on a season-long loan from Chelsea in August.